Guillermo Barros Schelotto, Diego Jimenez, originally uploaded by frescoVA. 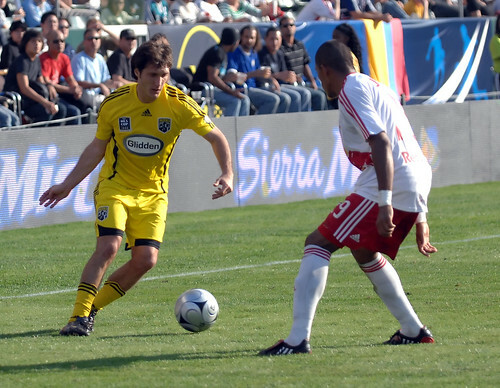 23 November 2008: The Columbus Crew defeated the New York Red Bulls 3-1 in Major League Soccer’s championship game, MLS Cup 2008, at the Home Depot Center in Carson, California. The 2009 MLS All-Star First XI was released today at MLSnet.com with 7 first time All-Stars consisting of one goalkeeper, three defenders, five midfielders and two forwards (3-5-2 formation). Guillermo Barros Schelotto led all players in combined voting, followed by Landon Donovan and Conor Casey. The 2009 MLS All-Star Game will be played on Wednesday, July 29 at Rio Tinto Stadium in Sandy, Utah against Everton FC of the English Premier League. The game will be televised live on ESPN and Galavision at 9:30 p.m. ET.